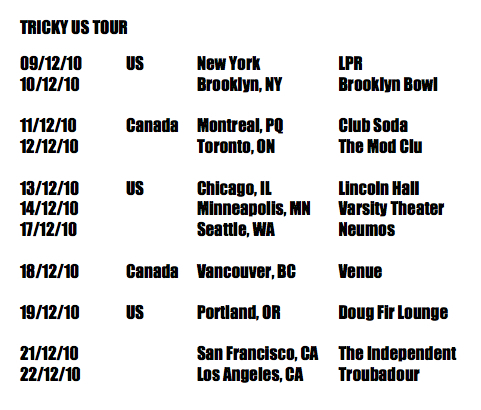 Tricky has two tour dates coming up, San Francisco today and then L.A., before it’s christmas. But I found this video. Enjoy. If you were waiting in Chicago, waiting for Tricky, you might have been disappointed by the cancellation of the gig. If you read about the reason you might be happy he survived that day, because he and his band got stuck in a snow storm near Ontario, Canada, on the way from Toronto to Chicago. Over 300 motorists were stuck there. 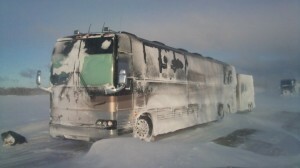 Here’s a picture of the bus. Not only the show in Chicago had to be cancelled, but also the one in Minneapolis. John Pris, you deserve lots of christmas gifts. One of them I’ll send you. TRICKY is in the United States of America, more precisely North America, kicking off his US tour today at the LPR (Le Poisson Rouge) in New York. Tomorrow everyone in that area could also catch him at the Brooklyn Bowl, Brooklyn. the B-Side download track (“Ghetto Stars” french version feat. Coeur de Pirate) has been taken off Domino Records download site a few days ago. It wasn’t downloadable for Germans, so I couldn’t buy it, but listen to a few seconds (stream). The only thing you can get is “Ghetto Stars” as a single download, but it seems to me as if it’s the same version that’s on the album. I wonder why all this happened and what’s going on. I’ll keep you updated. The last weeks I was wondering what song would be on the B-side of the “Ghetto Stars” single. The single should have been available in stores now, but it’s not actually, so there might be no physical release. It’s listed on Amazon, but you can’t order it. BUT you can download the single here. And there the you can see what’s the “B-side”. No other than Couer de Pirate laid down french vocals for a different version of “Ghetto Stars”. Great.